Dropbox is a powerful cloud storage platform service. It offers free 2.0 GB cloud storage memory to the customers. With this application, you can backup your videos, photos, application APK files. Dropbox provides an intuitive dashboard interface that allows you to manage files. The panel provides an option to upload, delete files or group them into folders. 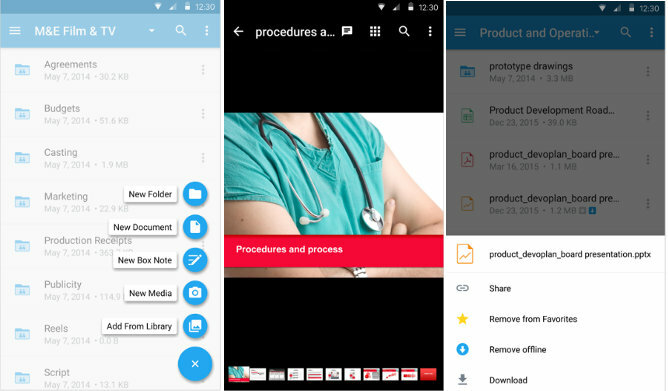 Dropbox is easy to get started with and has an APK size of 48 megabytes. It lets users share large files with a person of any geographic location. The recipient doesn’t have to install Dropbox on his PC or phone to access or download the shared files. Dropbox has an automatic backup option that ensures that the important stuff on your mobile phone is uploaded to the cloud drive automatically. Unlike Dropbox, Google’s cloud storage app aka GDrive offers 15GB storage space to the users. Because of the enormous free space it offers, GDrive has registered a billion downloads on the Google Play Store. Dropbox has 500 Mn users. Once you register an account with Google Drive, you can access all your files from any device or computer. 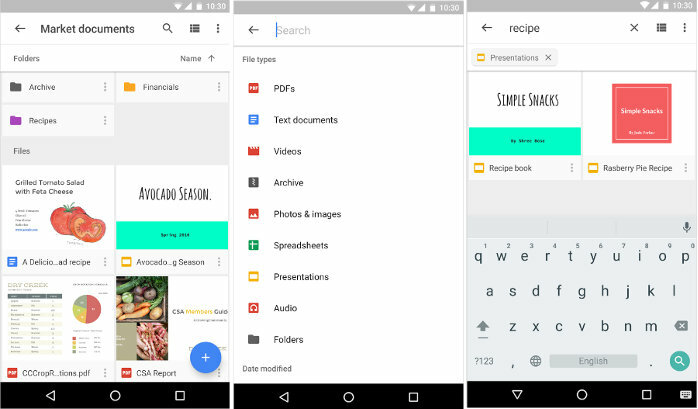 You can also share your uploaded documents, photos, and other files with other users. The best thing about this app is that if you have already connected your Google account to your Android device, GDrive will not prompt you to enter the login details again. It will log in automatically. The Dropbox alternative has a robust interface and it supports Google Photo service. It allows users to make uploaded files available offline. It allows you to leave comments on shared files and has search utility to locate a file quickly. If you use services such as MS Office, PowerPoint, Excel on a daily basis, then you’ll love the free OneDrive application from Microsoft Corporation. MS-OD is deeply integrated with important Microsoft web services. 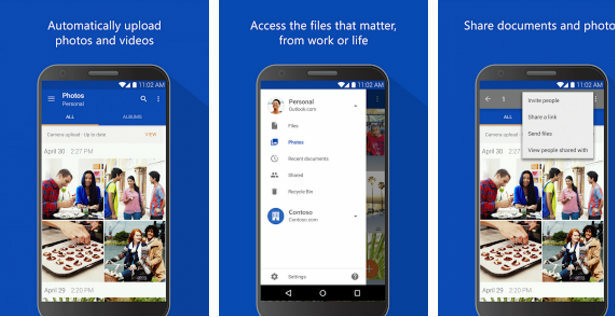 Microsoft’s OneDrive cloud storage app is robust and intuitive. Once you sync your important files to OneDrive service, the Microsoft’s cloud service ensures that it is available all the time. MS OneDrive tags your photos automatically to ensure that the user doesn’t have to spend several minutes finding them. It allows users to access their documents offline. When a shared document is edited by any other user, MS-OD will let you know about the changes. MS permits 5GB of free storage on its OneDrive cloud platform. It lets you create photo albums and provides an option to share the album with friends. Although Box doesn’t have as many users as Google Drive, OneDrive or Dropbox, the firm is trusted by over 1 million users. Hence, it is a great alternative to the three cloud storage services we’ve mentioned above. Box supports over 190 file formats. It lets you preview the files you upload in high-definition quality. The cloud storage platform lets its user upload files until the used storage space reaches up to 10GB. Box can generate shareable links through which users can share files with their friends. It allows you to manage the security of files you have uploaded to its server. It supports offline file sharing and has the option to print files on the go. The free cloud storage app enables users to drop comments on their files. It also allows users of third-party services to do the same. It is one of the top-rated free cloud storage apps like Dropbox. Yandex is an internet company owned by the firm behind several popular web services in Russia. It had launched the cloud storage service Yandex Disk in April 2012. Its app, which users can download for free has within 500k to 1 million users and a good rating of 4.5. YD offers 20GB free cloud storage space to all users. Yandex claims that your files will stay safe even if they are synced periodically to its servers. 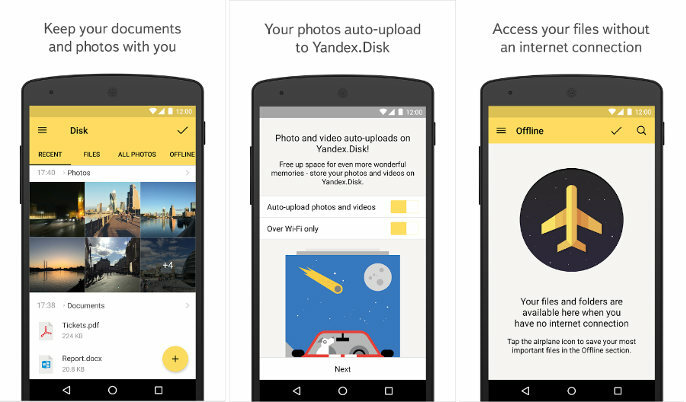 Like Dropbox and other providers, Yandex lets users share files with links. For premium users, Yandex offers storage space up to 1TB. YD is one of the best apps like Dropbox. Conclusion: Low budget and mid-range Android mobile phones/tablets and iPhones have 4GB to 32GB storage space. In case your phone doesn’t have enough room for new storing new files, download one of the above top cloud storage apps on your iPhone or Android device. The apps are free. You can use them as long as you want.